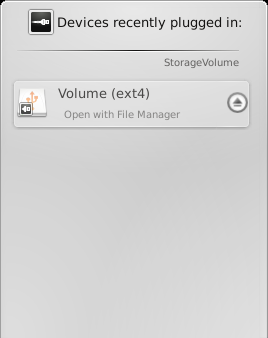 How to mount and unmount USB disks, thumb drives, etc on RHEL6 Linux using KDE. Click on the device you wish to mount. If the filesystem has a label you will see that in this menu, if not it will just list the filesystem type like ext4 or vfat. In this case, Volume (ext4) is the only option as the filesystem has no label. This should open a file browser for that device. It will also create a directory in /media with the filesystem label. If the filesystem doesn't have a label, like in this case, it will create the directory /media/disk. When you are ready to remove the device, exit all file browsers and any other programs accessing that device including shells in that directory. Next, click on the Device Notifier icon in the panel (looks like a USB symbol, usually in the bottom left corner of the sceen). If you get an error popup like below, it means you still have a shell in /media/<devicename> or some program accessing that device. If the USB icon in your panel (usually in the bottom left corner of the sceen) briefly changes to a check mark like below, then the device has been safely unmounted and you can now physically disconnect it.